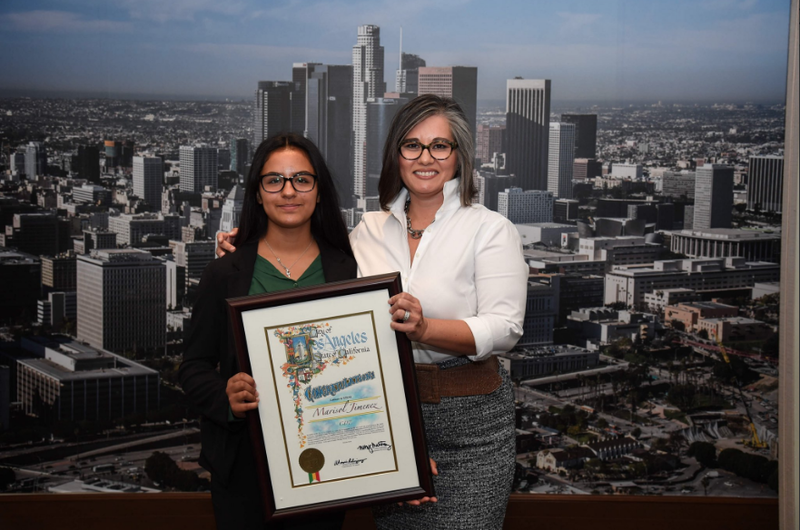 Marisol Jimenez (Left) and Los Angeles City Councilwoman Monica Rodriguez (Right) at The Latinas in STEM Breakfast, held at Los Angeles City Hall on October 2, 2018. This interview was conducted by Ronee Connell, Strategic Partnerships and Communications Manager for DIY Girls on October 17, 2018. 1. When did you first join DIY Girls and which programs have you participated in? I started DIY Girls when I was in the fifth grade at Telfair Elementary School and I participated first in the Creative Electronics program. I didn’t continue in middle school because my school did not offer the program there, but then I joined DIY Girls again in tenth grade at San Fernando High School after my math teacher encouraged me to join the program. I am currently participating in the Invent Girls program as a junior. 2. Were you interested in science, technology, engineering, or math before joining DIY Girls? What were you initial perceptions of STEM? Honestly, I initially did not have any opinions on STEM. Before I joined DIY Girls, I always wanted to be a lawyer. The first time I ever became interested in STEM was when Luz Rivas came to visit us at Telfair. She delivered a presentation at Telfair in the auditorium about DIY Girls. She gave us a taste of some of the fun the hands-on activities we would be doing and let us play with conductive play dough and LEDs. After that, I was interested and I decided to join. 3. How has DIY Girls impacted your life and changed the way you think about STEM? Greatly! First, I had no intention of even going into STEM because I didn’t even know much about it. Once I joined DIY Girls, I was able to learn more about it and I realized how much I enjoyed it. 4. Has there been a specific peer or instructor that has influenced you for the better while being involved at DIY Girls? Yes, definitely Luz Rivas because she was the first real STEM mentor/teacher I ever had and she taught me so much. More recently, a couple of my high school teachers including my math and physics teachers. I had AP Physics and I hated that class at first because it was so hard but I learned so much and I had a great teacher to help get me through it. 5. What is your favorite memory from the DIY Girls program? I really enjoyed being in the Creative Electronics at Telfair. My favorite memory was meeting Luz and playing with the conductive play dough. I also really enjoyed learning how to solder. 6. You were recently an honoree at Councilwoman Martinez’s Latina Breakfast. How did you feel receiving the award and what did you take away from the experience? I really enjoyed the entire experience and receiving the award made me feel special, it was such an honor. It was amazing to meet all the other honorees and hear how they are working to make the STEM field more diverse. Especially since I’m only in high school, it was really interesting to meet some of the women that work for NASA and JPL. I hope that I can be like them one day. 7. What would you tell other young Latinas that are interested in STEM or joining DIY Girls but feel intimidated or unsure if they will succeed? I think that regardless of how they feel, they should always try first. In my own experiences, it’s been hard when I’ve been compared to other people or when I feel like I can't succeed, but I think it’s the intent behind it that counts. One thing that has helped me is the “2-minute rule” which basically says if it takes 2-minutes to complete, just do it then and get it done. 8. What college do you plan to attend and what would you like to study? I want to study engineering and I’d like to go to MIT. I’ve also thought a lot about the Pomona colleges and a couple of UCs including UCLA.